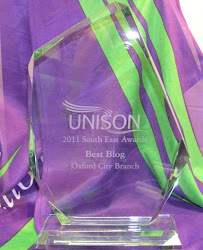 Oxford City Branch of UNISON: Hands off our pensions! The TUC today unanimously passed a motion supporting strike action in defence of public sector pensions. 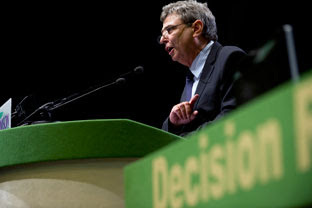 The motion was proposed by UNISON's General Secretary, Dave Prentis. Read what he said here. While some other unions took strike action in June this year, UNISON was one of the unions who held back while negotiations continued. We've been patiently waiting for 8 months now. As Dave said this morning, "there comes a time when we say 'enough is enough'". Our pensions were reduced in 2008 with the abolition of the "85 year rule" which allowed those of us with at least 25 years service to retire at 60 on an unreduced pension. Savings made by that and other changes implemented in 2008 mean our pensions are now sustainable in the long term. This round of pension cuts is purely about taking our money to plug the hole in the economy left by the £multi-billion bail out of the bankers. From April 2011, our pensions have already been drastically reduced (by at least 15%) by simply changing the measure of inflation used when calculating the annual uprating. No one was consulted about this. Those of us in the pension scheme are now being told to pay an additional 3% of our earnings in contributions. This money does not go to the pension scheme - it goes straight to the treasury. It is a tax on pensioners. If you aren't in the scheme, you don't pay it. We are also being asked to work longer (until 67) and receive less at the end, due to a reduction in the accrual rate. It's time to say "Enough is enough!" HANDS OFF OUR PENSIONS! Please make sure you receive your ballot paper, by updating your details on-line. If you have not used this service before, you'll need to register first. Please have your membership number handy. 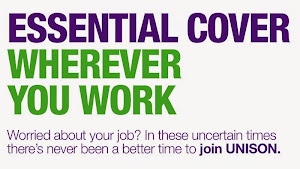 If you don't know your membership number, please ring UNISONdirect on 0845 355 0845.